We need to lift developing countries out of poverty, increase health, education and security. But this will involve lifting the carbon emissions per person in developing countries to provide health, electricity and education. We need to do this, we can’t not do it. 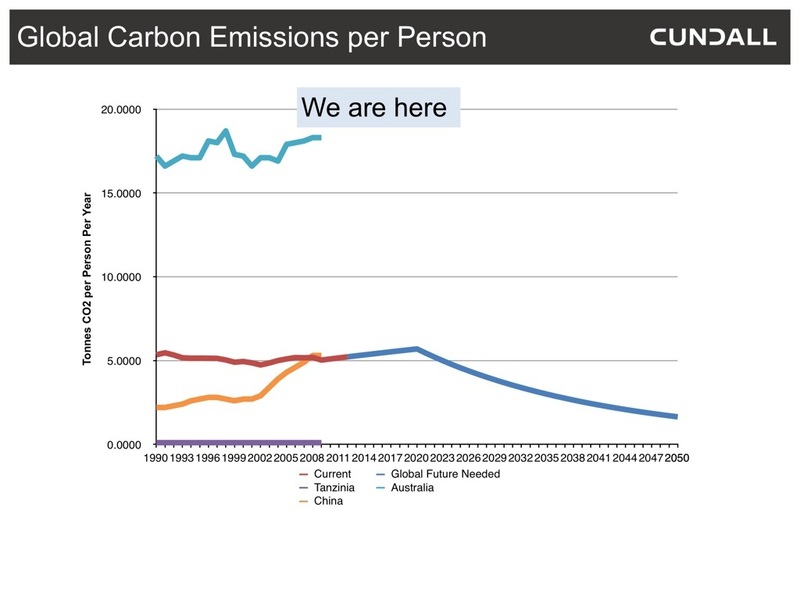 But we also need to reduce our annual global carbon emissions. So how do we balance the two? The first step is to understand the challenge. The general consensus on the required carbon emission reduction works out to be about 3.5% per year, every year until we hit 80% total reduction in 1990 levels. Whether its 350.org, garnaut, stern, IPCC – they all work out to be around 3.5% per year. 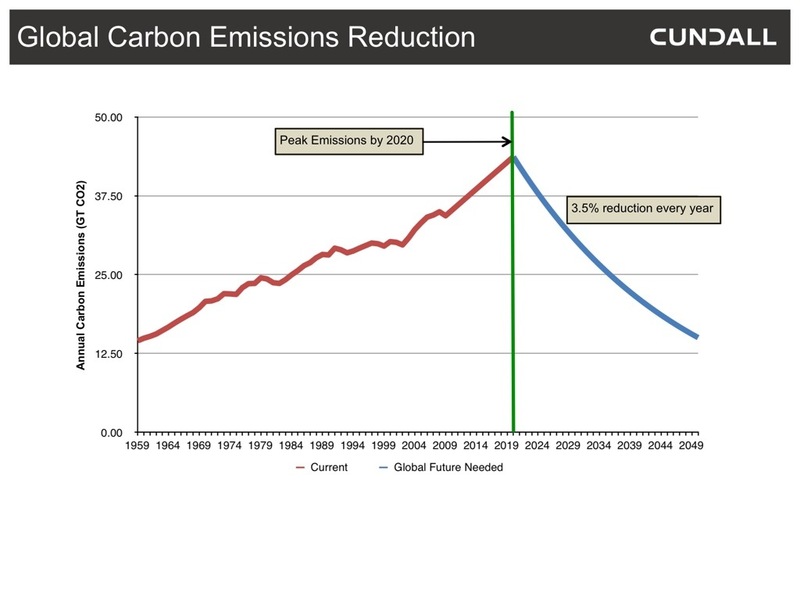 The chart below shows where we currently are and what a 3.5% annual reduction from 2020 onwards looks like. So it’s fairly simple and 3.5% a year doesn’t seem to be that hard, right? It’s a scarier picture when you consider carbon emissions per person. Overlaying the average UN predictions for global population increases means that we need to reduce our global carbon emissions per person from 5 tonnes per person a year to 2 tonnes per person per year. Again, only about 3% reduction per year – sounds easy right? Not really, not for us Australians. The global average carbon emissions per person is 5 tonnes per year, the average Australian is 18 tonnes per year – over three times the global average. At the moment our extremely high emissions are being offset by developing (poverty stricken) countries such as Tanzania. But we need to lift them out of poverty, improve health, education and security. So a life free of poverty is about 1 tonne per person a year AND we need to get our global average down to around 2 tonnes per person per year, this will mean that our Australian average needs to come down to at least 4-5 tonnes per year. All assuming developing countries stop at around 1-1.5 tonnes – China is already at 5 tonnes per person! 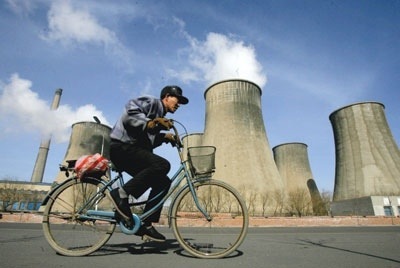 Which should we focus on – reducing poverty or reducing emissions? Without sounding like a question dodger, we have to do both. We can’t globally afford to lift developing countries out of poverty without reducing our own ecological footprint – whether that’s in carbon emissions, energy, water, resources or whatever metric you can think of. Yes, we need to fund community level initiatives in developing countries but we also fund local community initiatives to reduce our own footprints. We only have one planet and we need to live within its means together. ← Green architecture – but what about hot still days?